There were many words that you could not stand to hear and finally only the names of places had dignity. Abstract words such as glory, honor, courage, or hallow were obscene. Stephen Ambrose Historical Tours’ new WWI Tour marks the 100th anniversary of the War to End All Wars. 2017 marks the 100th anniversary of the U.S. joining its allies to fight in WWI, while 2018 marks the 100th anniversary of the end of WWI. Our WWI; War to End All Wars Tour will explore the most significant sites along the old Western Front, seeing where history was made and discussing the Great War’s terrible consequences. From 1914-1918 millions of men fought each other across a brutal 475-mile long “No Man’s Land,” that stretched from the North Sea to the Swiss border. When the guns finally fell silent, 10 million soldiers were dead, century’s old monarchies were overthrown, the map of the Middle-East was redrawn, the United States had become a world power and an angry and embittered Corporal Adolf Hitler returned to Bavaria determined to avenge the humiliation of defeat and return Germany to greatness. Chris Anderson leads our WWI Tour: War to End All Wars. He is a senior historian at Stephen Ambrose Historical Tours. Chris is well versed in many aspects of American history. He has spent considerable time researching and studying the First World War. After college, he moved to the UK for a year to interview British veterans of the Great War. Later as assistant curator at the Historical Society of the Militia and National Guard, he was able to interview many surviving American Doughboys. As the former associate editor of MHQ: The Quarterly Journal of Military History and WWII Magazine, he edited and wrote about all areas of American involvement in both WWI and WWII. You can read his full bio here. Guests travel independently to Brussels, Belgium. A defining moment in European History, the June 18, 1815, Battle of Waterloo redrew the map of Europe and altered the balance of power on the Continent. In the Allied victory over the French, however, lay the seeds of a conflict far more terrible than anything Napoleon or Wellington could have imagined. After meeting in Brussels, we travel to the Wellington Museum, located in the “Iron Duke’s” former headquarters, to see its amazing collection of artifacts related to the battle and the commander of the Allied army. Our first stop on the battlefield will be the recently renovated museum and visitor’s center, the famous cyclorama painting of the battle and Lion’s Mound, then a tour of the battlefield itself. We continue to Ypres in the heart of the British sector. In 1914 some of the first clashes between the Germans and the British Expeditionary Forces occurred around the town, which would remain a battlefield for the rest of the war. We begin with the Ypres Salient at Essex Farm Cemetery, where Canadian writer John MacRae wrote the famous poem “In Flanders Fields.” Then it’s on to Hooge to visit remains of trenches and sites associated with the very first battles fought around Ypres. Nearby Langemark was the site of the first use of gas on the Western Front as well as the German cemetery. We then tour sites around the Salient including the battlefields of Passchendaele and the Memorial Museum Passchendaele 1917 and its unsurpassed collection of uniforms, weapons and other artifacts. We also explore the huge British underground bunker complexes used by the British as well as preserved German and British trenches. We finish the day with the incredibly moving Last Post Ceremony, which honors the 250,000 soldiers of the British Empire who died in and around Ypres and have no known grave. Begun by the British in April 1917, the Battle of Arras was intended to be a diversionary assault on a larger French offensive launched along the Chemin Des Dames further south. Events, however, meant that the battle grew in size and scope into one of the bloodiest encounters of the war. We view the remains of a German bunker used by Corporal Adolf Hitler while a runner in the Bavarian List Regiment. We continue on to Ploegsteert (Plugstreet to the British), where a young Winston S. Churchill commanded a battalion in 1915 and experienced horrors that would remain with him until he became prime minister at the start of World War II. From Ploegsteert we will stop outside the village of St. Yvon to see the spot where German and English soldiers ceased fighting to celebrate Christmas 1914 together. The Island of Ireland Peace Park and New Zealand memorial, with its preserved German bunkers, will be our next stop. Our first day in Arras will be at the Wellington Quarries Museum where the group will travel 70 feet underground to see the 12 miles of tunnels that 20,000 men called home. We exit Arras by the old Roman road at the heart of the battlefield. En route we will make stops at each of the three defensive lines that the Germans held in such strength in June 1917. Next we see the Canadian National Memorial at Vimy Ridge to visit the preserved battlefield and then go on a private tour of the trenches that Canadian engineers dug under the German lines prior to the battle. Trescault is next where November 20, 1917 nearly 400 British tanks on crashed through the German front line and drove toward Cambrai. The Battle of the Somme began July 1, 1916 and was the darkest day in the history of the British Army. Nearly 60,000 men would become casualties by sunset. For the next 141 days the soldiers of the British Empire hurled themselves against German positions along the Somme River. Our study of this five-month battle will begin at the Hawthorne Ridge Crater. We then explore the preserved trenches at the Newfoundland Memorial Park before making our way to the Ulster Tower and Schwaben Redoubt. After seeing the spot of the furthest British advance on July 1st, we will go to the Thiepval Memorial, which lists the names of 72,104 men killed on the Somme who have no known grave. The group finishes at the Butte de Warlincourt where the terrible fighting along the Somme finally came to an end. Leaving the British sector of the front, we visit the site of the airfield at Cappy where Manfred von Richtofen took off on his final flight. Moving on, we will enter the region of the Somme fought over by two untried American infantry divisions in 1918. We will follow the attack made by Doughboys from the 107th Infantry Regiment on September 29, 1918, as they broke through the “impenetrable” Hindenburg Line and suffered the highest casualties of any American Regiment on a single day of the war. Our day will conclude along the Chemin des Dames, the 25-mile long road where General Robert Nivelle launched the disastrous offensive that cost France 188,000 casualties and precipitated the mutinies of 1917. The group will tour the underground Caverne du Dragon where French and German soldiers fought a bitter underground war as well as the Point California where vestiges of some of the bitterest fighting along the Chemin Des Dames remain. With Russia’s exit from the war, the Germans were able to move some 50 fresh divisions to the Western Front to make one last great effort to win the war before millions of American soldiers could enter the fray. Launched in the spring of 1918, “Operation Michael,” crashed through Allied positions all along the Western Front and soon the Kaisers soldiers were within 50 miles of Paris. Desperate, Ferdinand Foch pleaded with American Expeditionary Force commander John Pershing to release untried American troops to plug holes in the line. Pershing agreed and in a series of engagements at Chateau Thierry in May and Belleau Wood in June 1918 stopped the Germans once and for all. We begin the early American battlefields at Fere-en-Tardenois and AEF commander Pershing’s headquarters. Here he and future Army chief of staff George C. Marshall planned the great American offensives at St. Mihiel and the Meuse Argonne. Next is Pershing’s headquarters, where according to Douglas MacArthur, Doughboys, “stormed and captured the Croix Rouge Farm in a manner which for its gallantry I do not believe has been surpassed in military history.” We move on to the Oise-Aisne American Cemetery to pay our respects to the 6,012 men buried there and the grave of poet Joyce Kilmer, the author of the famous poems Trees and Rouge Bouquet. Our visit will take us to the bridges held by elements of the 3rd Infantry Division against incredible odds in May, the impressive American memorial that sits on the heights overlooking Chateau Thierry and then to Belleau Wood where, over the course of 25 immortal days, U.S. Marines fought a battle that is rightly remembered as one of the Corps finest hours. Throughout the summer of 1918 American forces were part of the Allied effort to retake ground lost during Operation Michael. The Doughboys demonstrated that they were a competent and professional army ready to take on the best the Germans had. Next is the tiny village of Chamery where, on July 14, 1918, President Theodore Roosevelt’s son Quentin had his last dog fight. 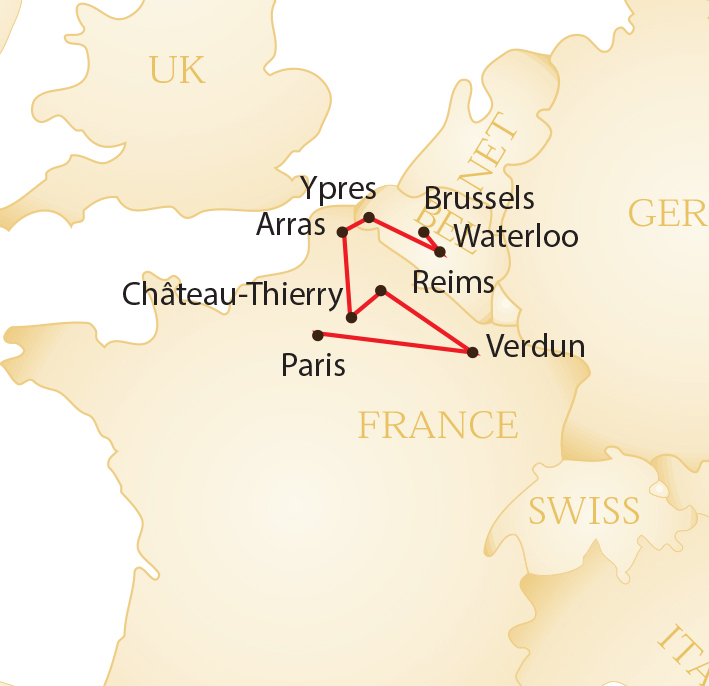 We conclude in the ancient city of Reims where we will have an opportunity to enjoy some of the Champagne regions celebrated wineries. No visit to the Western Front would be complete without a visit to the fortress city of Verdun and the surrounding battlefields. During this nearly year-long battle, France would endure greater losses than America has in all of its wars since the American Revolution until Desert Storm. Our first stop is the recently refurbished Memorial de Verdun Museum. We continue to the ghost village of Fleury then include the Ossuary, which contains the remains of 130,000 unknown soldiers as well as the famous Trench of the Bayonet, where a protruding line of bayonets reminds us of the French soldiers still on duty. Lastly at Verdun is Fort Douamont, the most important of the 19 forts and site of some of the heaviest fighting in the 10-month long battle. Involving more than 1.2 million men, the Meuse Argonne offensive is the largest land battle in American history and where the war was finally won. German warlord Paul von Hindenburg remarked after the war, “that the British food blockade and the American blow in the Argonne Forrest decided the war for the Allies.” Despite this, most Americans know very little about this climactic 47-day battle. Our day begins at one of the largest sections of preserved trenches along the whole of the Western Front, the archaeological site at Massiges. Next we go to the Valley of Moreau, where a dedicated team of volunteers has preserved one of the large German rest areas used by the Germans in the Argonne. We discuss the battles fought near here by a young Erwin Rommel in 1918. At day’s end we stop at Essay to see where George S. Patton led American tanks into combat for the first time. Revisiting the American offensive of autumn 1918, we go to the steeply wooded valley outside of Apremont where the “Lost Battalion,” gained immortality for its epic six-day defense. We then go to Chatel Chéhéry where we walk in the very footsteps of Sergeant Alvin C. York, a former conscientious objector, who single handedly killed 20 Germans and captured 132 others. Our time in the Argonne concludes at the Musée de Romagne 14-18, a collection of artifacts discovered on the battlefields. Following lunch at the museum we will take a short driving tour, visiting sites associated with future president Harry S. Truman and George S. Patton. We begin at the American Memorial at Montfaucon, explore the remains of the village destroyed in the fighting, and ascend to the top of the memorial. Guests will see the ground fought over during the largest battle in American history. From the memorial we go to the Meuse Argonne American Cemetery at Romagnes. The largest American cemetery in Europe, we will pay our respects to the 14,246 Americans buried there before heading to Paris. On the way we stop in the Forest of Compiegne, where we visit the clearing where, on November 11, 1918, the armistice that brought an end to the fighting was signed. Morning transfer to Charles de Gaulle airport. Extra nights available at the group rate in both Brussells and Paris. Call us for more details. September 27 - October 11, 2019 - Waitlist only. Prices are per person based on double occupancy. For a single room add $1,300. I enjoyed a terrific tour of the WWI battlefields in Belgium & France last fall with historian Chris Anderson! It was the 100th anniversary of the US entering the war and it was an amazing 2-wk trip that began in Brussels then on to the Battle of Waterloo that re-drew the map of Europe in the early 19th century and set the stage for events leading up to WWI. My good friend and travel companion, Jim Hutson convinced me to go and I’m so glad that I did. Highly recommended!